An unauthorized vehicle crashed at Travis Air Force Base in California on Wednesday. 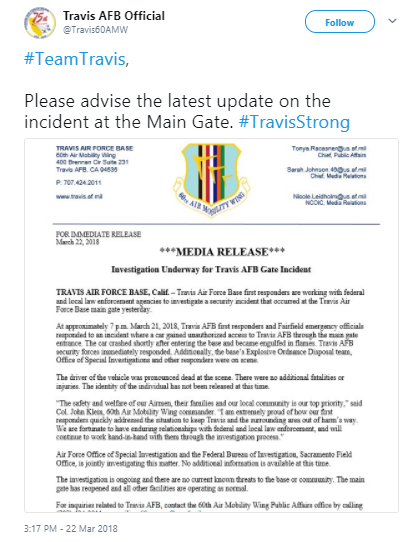 A car crash attack at the main gate of Travis Air Force Base in northern California on Wednesday night is being treated as an act of terrorism, according to a report. An unauthorized vehicle crashed into a ditch at the main gate of the Air Force base after breaching the security gates on Wednesday. The vehicle, loaded with propane tanks, erupted into flames and killed the driver while military personnel were making their way to the vehicle, according to CBS. Authorities said the driver ignited himself, which is why investigators initially treated the incident as an act of terrorism, CBS reported. The FBI joined the investigation, and Task & Purpose reported that a spokeswoman would not confirm the CBS report that the incident is being treated as terrorism. The driver of the vehicle has been identified, but their name has yet to be released by law enforcement. Additional security measures were implemented at the main and hospital gates. The incident was contained after personnel responded, and the base was at no further risk.